I agreed to read and review this book because a couple of my kids love to write and one absolutely does not. One of my kids wants to write books and is working on his first novel. He attends teen writer's conferences and has really enjoyed learning more about writing. He is my oldest. My youngest says she hates reading and writing. I always wonder what I did wrong with her to make her say that. I'm not sure. 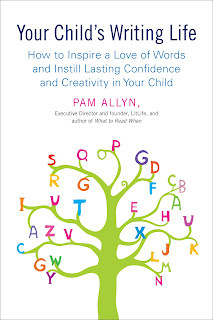 So, I was interested in what Pam Allyn had to say about writing and reading in her new book. I took a page full of notes! Obviously as a book blogger, I love to read and I love to write about what I read. The first section of this book had so many great quotes. Here are a few that I loved. "Reading is like breathing in, writing is like breathing out." Ooh, how great is that?! "Of all you can do for your child, instilling in him/her a writing life is one of the best, cheapest, most lasting ways you can make a tremendous difference in the overall academic experience and outcomes your child will have." "There is a power in being able to say exactly what you mean." I love all the ideas in this book. 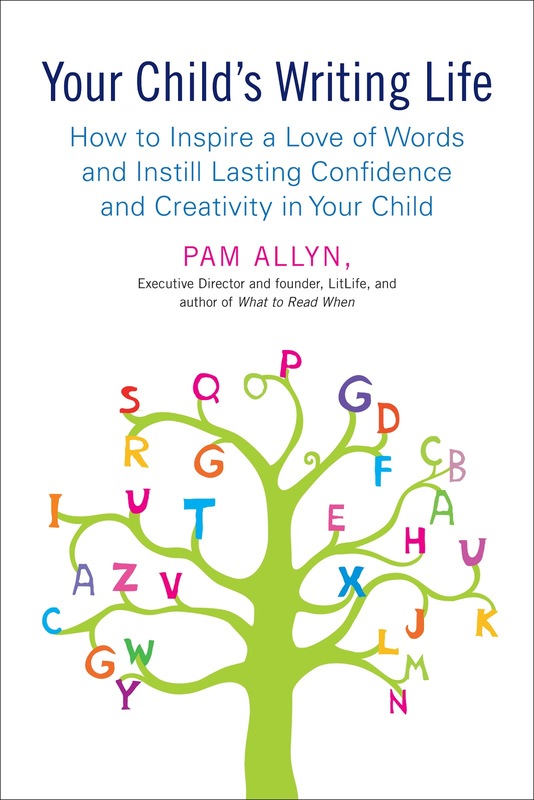 Pam Allyn literally takes you through the years, from birth to older teenagers, giving you ideas for helping kids to write. Why is writing so important? Ours is a world of words. If kids learn to write, they learn to express themselves. They learn creativity. Allyn says test scores at school will improve because writing teaches kids to think and increases their mental stamina. First, Pam urges parents to establish “The Five Keys” to WRITE: Word Power, Ritual, Independence, Time, Environment. She gives ideas of how to do these things with each stage of your child's life. A couple of the ideas I really liked were having a word jar where you pull out a new word to learn each day, and having your child draw a picture and then tell you the story that goes along with that picture. I like that she recommends expanding your children's reading to all kinds of books. Fiction, non-fiction, poetry and so forth. In the next chapter was full of great information on the stages of writing development. Again, Allyn takes us through the years and gives us ideas. At the end of each stage, we are given three different helps. Writing elements you will see, writing activities for that particular stage and great books that will also help your kids. There is so much great information in this section. I particularly enjoyed the chapter that calls in the "Writing Dr.". It helps you find ways to help that child who may be resistant to writing, or a child who struggles with writing. I found ways to encourage my children and compliment their writing. There is a whole section on writing prompts to help get your kids thinking and writing. It was so fun reading through those ideas. I wanted to start writing about some of them myself. Some of these things my kids do, like write restaurant menu's and make words with their spaghetti-o's. I wanted to start writing about a message in a bottle and I wanted to act on the idea of creating a new character Facebook profile for somebody I dream up. Such fun ideas. I think this is a great book, full of help and ideas for everyone to get writing. For me, writing is a way of preserving memories and ideas. It charts growth and helps promote understanding. I am glad to have read this book and would encourage you to pick it up too! A love of writing is a great gift to give to your children. What a beautiful blog...love the brown and blue. If only I could GET my child to write! now they are NOT going to teach cursive in schools! It was on our local news for the entire country! We don't need it now they say. Who is 'they' all the time?? I'd LOVE to know!! This book would be GREAT for kids if a parent could ONLY break thru! This book sounds fantastic. As a writer and lover of books, I hope that my children will experience some of the same joys. So far my oldest, 8YO, loves to read and write and I want to help her stay on that path. Thanks for the review. Now I didn't know the part about not teaching cursive, how will our children sign anything if they don't learn cursive. Printing doesn't embody the same distinctive qualities as cursive does in a signature. Nothing like leaving our children open to get fleeced blind as adults than to eliminate learning cursive. I know my children have learned it in school and will hopefully continue to use it in their education. Sorry off topic, but I had to express alarm at that concept. I was going to say I wouldn't feel bad about having one child that doesn't like to read or write. You're doing better than me, my daughter who is also my oldest is the only one of my children who has any interest in either. I personally think it's partially because her father encourages the interest too so she receives encouragement at home and on visitation. My sons' father hasn't read a book since assigned homework in high school. When they go on visitation the only encouraged interests are sports. So it seems like nothing I do can make my boys interested in books or words. Anyway I just wanted to say only having one not interested is a lot better than only having 1/3rd of your children interested. Laurie- I have no idea who "they" are most of the time. I sure hope cursive won't be taken out of schools. Thanks for your comment. @alyssa and elizabeth, Thank you. Rachelle, Thanks. Having your kids love what you love is awesome. I'm going to have my daughter write up a review this week as she has expressed some interest. I hope she enjoys it! New Summer Giveaway Hop Winner! My Two E-book Giveaway Ends Tomorrow! Giveaway, Review AND Author Interview!